Mobile Version 11th PRC 2018 Expected New Basic Pay Calculation with Different Fitment Software for AP TS Employees: Expected New Basic Pay In PRC 2018 at Different Fitment Levels for Telangana and AP Teachers. 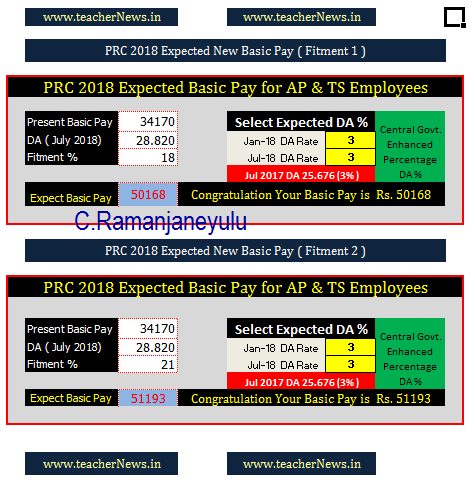 TS AP Expected RPS 2018 Basic Pay Calculate Software Prepared by C.Ramanjaneyulu from www.teacherNews.in. Expected Basic Pay ఎలా ఉంటుందో లెక్కించడానికి అతి సులువు అయిన SOFTWARE ను C.Ramanjaneyulu తయారు చేయడం జరిగింది. 11th PRC Fitment to AP, Telangana State Employees, Know your Basic Pay, Pay Fixation Calculator, Ready Reckenor Table, PRC 2018, Telangana PRC, Govt. Announces PRC with Fitment for TS /AP Employees. AP/TS PRC 2018 New Basic Pay Know your Salary in RPS 2018 at Different Fitment levels. AP & Telangana State Govt. Employees PRC 2018 Expected New Basic Pay in RPS 2018 at Different Fitment levels Pay Revision commission benefits to Andhra Pradesh and Telangana Employees from 01-07-2018. క్రోత్త PRC 2018 అమలు అయ్యే తేది 1-7-2018 కాబట్టి ఆరోజు ఉన్న D.A ను ఆరోజున ఉన్న PAY తో కలిపి క్రోత్త Basic PAY ను రూపోందిస్తారు. ఎంత Fitment ఇస్తే , Government ఎంత Basic Pay అవుతుంది Fitment Level 11 నుండి 40 వరకు Software లో కలదు. ఇది కేవలం అవగాహన కోసం మాత్రమే తయారు చేసింది. How to Calculate the Basic Pay in PRC 2018 ? Total of the above three will be ground basic. Your New Basic will be above the ground basic in the New Revised Pay Scale 2018 (Basic + DA@ 28.820 + Fitment@21%). Note : Sir/ Madam and Friends, Any Modifications and Suggestions send in below Comment box for Update PRC Software. Thanks to all. 11th PRC 2018 New Basic Pay Salary Calculation with Different Fitment Percentages PRC 2018 Software C.Ramanjaneyulu Prepared for Telangana AP Employees and Teachers.